In large ovenproof skillet, heat oil over medium heat until it shimmers, about 1 minute. Add flour; quickly beat with whisk until it comes together. Cook and stir 1 minute. Gradually add milk, beating constantly with whisk until smooth. Heat sauce to boiling. Reduce heat to simmer; cook 5 minutes. At the same time, beat in cheese. Once mixture has thickened, cook about 5 minutes longer. Add lemon peel and lemon juice; beat to combine. Season to taste with salt and pepper. Add chicken and peas. Separate dough into 12 breadsticks. 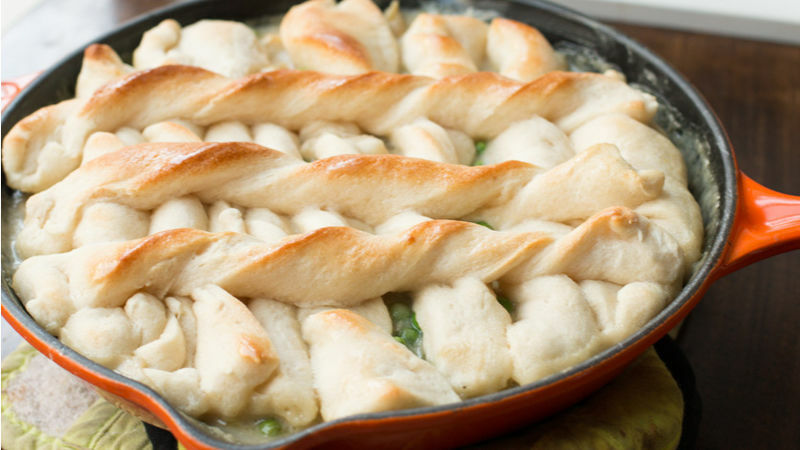 Twist each breadstick; arrange over chicken mixture in skillet, placing the last 3 across in the opposite direction. Bake 10 to 12 minutes or until breadsticks are golden brown. Serve immediately. Any kind of milk or whipping cream is fine to use depending on how healthy you want the sauce to be. You can add even more nutrition by adding carrots, corn or even potatoes to the dish like a pot pie! The sauce and chicken can be made an entire day ahead, then add the breadsticks and bake when you’re ready to serve.